Eric & Suzy perform as a duo (and as a trio with daughter Allegra on bass) and also have several bands and ongoing collaborations. 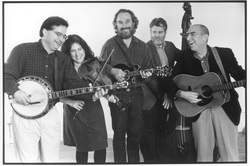 Latest group is Blue Diamond Strings, with Jody Stecher, Kate Brislin, Paul Shelasky and Paul Knight - info on that group will be up soon! Please scroll down and click on the photo for a link to more information about the Aux Cajunals, the Todalo Shakers, or the Bluegrass Intentions. The Aux Cajunals play old-fashioned southwest Louisiana party music for dancing and listening. The Todalo Shakers (pronounced Toe-Dah-Low) specialize in string band blues: 1920's style jug band party music with lots of harmony vocals. Del Rey & Suzy Thompson: Blues, swing and original music that's wise, womanly, witty and well-played. Del Rey is a master of the resonator guitar and ukulele; she and Suzy have been playing music together for more than twenty years. Click on the photo to reach Del Rey's website. Guitars Without Borders: Flatpicking magic from acoustic power trio with Scott Nygaard, Jody Stecher and Eric Thompson. 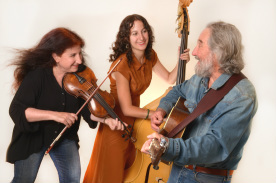 The Bluegrass Intentions: High-energy, old-school bluegrass -- Bill Monroe meets Memphis Minnie at the Cajun fais-do-do and together they buck dance their way into the 21st century.